Whoa. 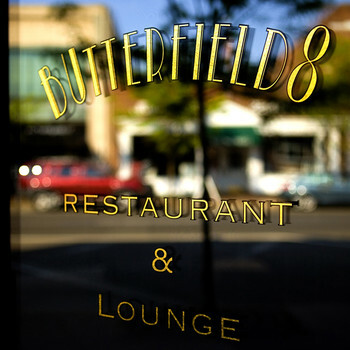 On News 12, I just saw the chef at Butterfield 8 and he said they have macaroni and cheese... with jalapeno and bacon. I am so there!!!! The chef, Masekela Jones, also said they have date night Thurs- 50 bucks for appetizer, entrees and dessert, PLUS a bottle of wine. I am also- SO THERE. He said they get their seafood from New Wave Seafood in Stamford so it's always fresh. This is why I love News 12 for local news. It's such a great idea to have local chefs come in and show off a few dishes. Ooh- Butterfield 8 also got Best Singles Scene in the Fairfield County Weekly, as well as Best New Bar. See text below, from Butterfield8's press page. Whether it's happy hour or late night, there's always big groups of young women and big groups of young men at Butterfield 8. There's lots of room, so you can roam and mingle, says Doug Newhook, regional manager. On Thursday nights, guys have been known to invite girls they've just met to join them right away for the Date Night special, a shared appetizer, individual appetizer, shared dessert and a bottle of wine for $50. The bartenders are friendly and energetic at Butterfield 8. The bar area is spacious and attractive, with planks of Brazilian chestnut rising seven feet up the wall. Adding to the comfortable feeling are the specials on food and drinks, $3 beers, $4 wine glasses, $5 mixed drinks, and $8 appetizers during the lively happy hour (5 to 8 p.m. Monday through Friday). The place draws people in their 20s and 30s who work at the corporate headquarters in downtown Stamford. I went to the date night at Butterfields. If you go, know that there's only a choice of about four appetizers and four entrees, and they do NOT allow you to swap other items on the regular menu (at least my waitress didn't). We ended up not using the date night menu and ordering food off the regular menu, which constituted over-cooked nachos and an undercooked burger. Also, the bar area (which takes up most of the restaurant) was so loud it wasn't exactly a romantic "date night". Decide for yourself, but I won't be returning.